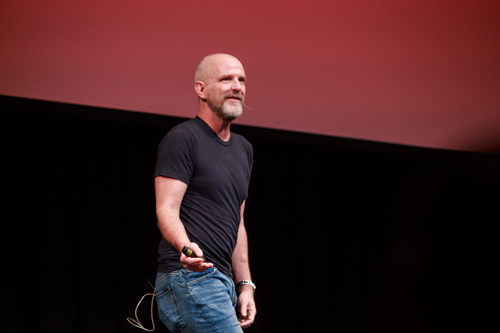 Michael Lopp bombed his first computer-science course at UC Santa Cruz. But he learned from that failure: Lopp re-took the course the next quarter, signed up for a bonus class on a different computer language, focused his attention, and aced them both. Today, Lopp is vice president of engineering at Slack, the popular team-building platform, and the author of two books and a blog about leadership, Rands in Repose. He returned to campus last month to meet with faculty and staff participants in the annual Leadership Academy, sharing a talk entitled, "New Manager Death Spiral." Lopp’s tech-industry credentials are impressive: Before joining Slack, a platform that now boasts 10 million daily active users and is used by 65 Fortune 500 companies, Lopp worked at Pinterest as the head of engineering, Apple as a senior engineering manager, Netscape, and Borland. Lopp first became a manager at Netscape in the mid-90s, when his boss walked in and asked him to take care of three colleagues, suggesting Lopp hold staff meetings and set up one-on-one discussions. "That was my management training right there," he said. Lopp identified the top mistakes often made by new managers: refusing to hand off tasks, failing to provide a team with important context, and not demonstrating trust. His No. 1 tip for avoiding the death spiral: aggressively delegate tasks, even if they're ones you enjoy doing. "Your job isn't to get things done," he said. "It's to get things done at scale." Lopp described the day decades ago when, as a senior engnineering manager at Apple, he presented CEO Steve Jobs with nine proposed icons for the Apple Store app that would soon launch on iOS. "These are all crap," Lopp recounted Jobs saying moments after the notoriously opinionated leader walked into the room. Three more times the team was asked to bring in nine different fleshed-out designs before satisfying Jobs, who ultimately—unwittingly—selected a design that he’d rejected during the first meeting. Years later, Lopp learned this is how Jobs approached his job. “It was a powerful moment—albeit in hindsight for me—to see a leader wanting to work with me to change his mind and develop an opinion,” Lopp said. Lopp attributes his ability to bridge the structured and technical world of computer code and the incredibly messy world of management to his parents—an engineer father and a photographer mother. Lopp, who grew up in the Santa Cruz Mountains, enrolled at UC Santa Cruz in 1989 to study computer science and lived at Cowell College.